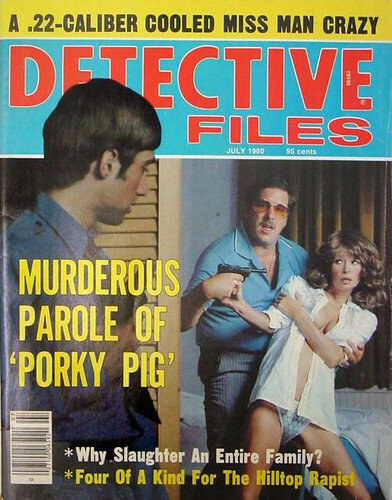 Some people call them true crime magazines, some call them light reading for serial killers. Is there anything more politically incorrect and offensive than these rags? There is literally nothing redeeming about them. 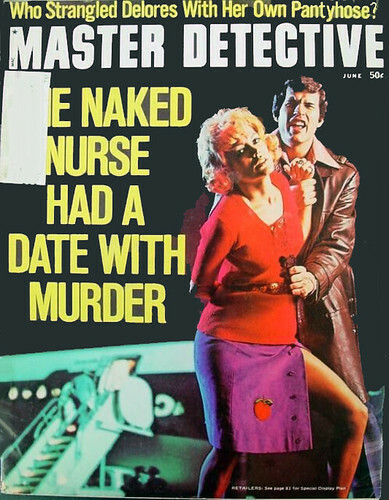 At least in the 1930s and 40s, these magazines had brilliant illustrations and cover art.... the trashy detective magazines of the following decades didn't even have these going for them. Glorification of violence, objectification of women, masochism, perversion, misogyny, paranoia.... if it's a societal evil, it's in these magazines. But I love them! Let's face it - sometimes you're in the mood for an expensive wine and cheese, and sometimes you just want a can of Schlitz and some Velveeta. 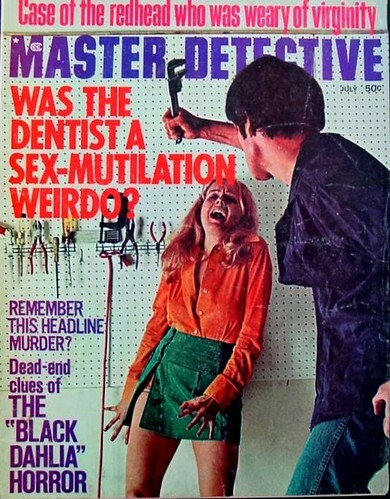 I'd love to tell you I derive no enjoyment from such deplorable pieces of filth, but the fact is: the cover headlines are hilarious and the articles are often fascinating - for those that like CSI and its ilk, will find plenty to interest them. 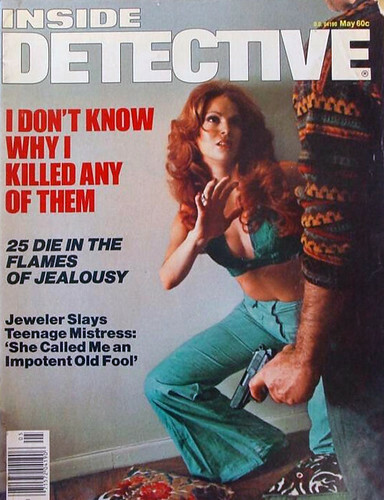 Indeed, many bestselling true crime authors got their start writing for these magazines, namely Anne Rule. Granted, the covers definitely are targeting man's baser instincts; but this was the seventies: a time of intense horrific violence from Vietnam broadcast in living color every night. This was a culture still shaken by The Manson Family. This was a decade when an unprecedented number of serial killers unfolded their body counts: Son of Sam, Ted Bundy, John Wayne Gacey, Henry Lee Lucas, and the most prolific of all, Gary Ridgeway in '82 and '83. 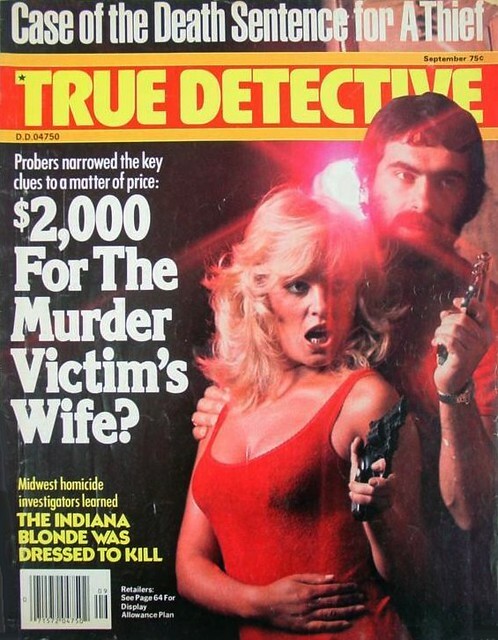 By the mid-eighties things had settled down a bit, and it was reflected on the covers of the true crime magazines. 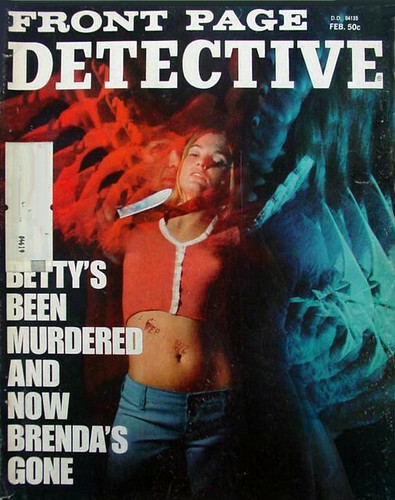 No longer did they regularly feature horrific acts of violence; instead, covers depicted some benign cheesecake - a slutty chick fresh from a hair band music video. The gritty trash that made you feel bad about yourself for even looking at it was long gone. Gone but not forgotten, that is. 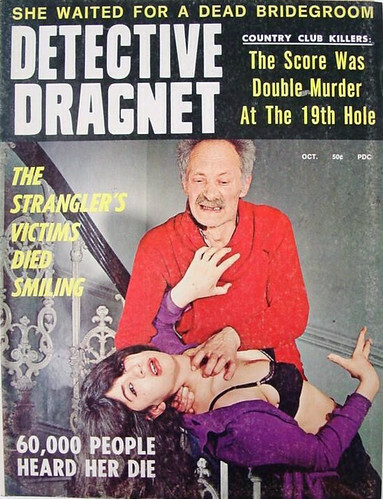 Retrospace proudly resurrects a tawdry array of sick, vile, and morally reprehensible true crime magazine covers. 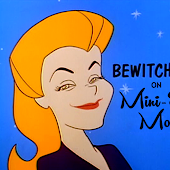 As usual, I can't tease you with a measly two or three morsels of illicit garbage. No, I've got to hit you with hot steaming piles of it - too much to fit in a single socially irresponsible post. 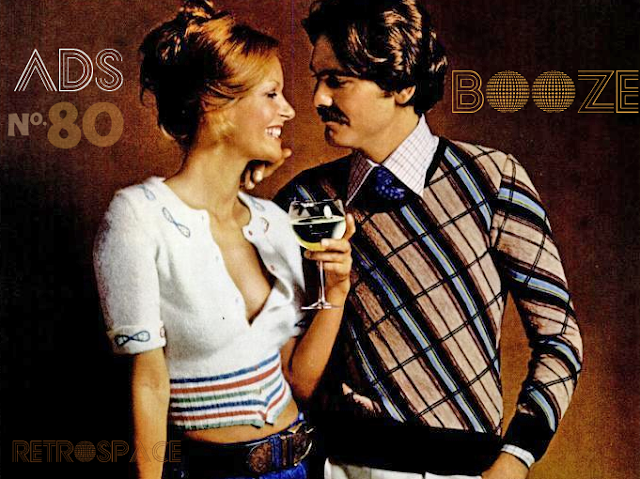 So, stay tuned for more seedy posts sure to pollute the blogsphere with their unconscionable filth. Enjoy! 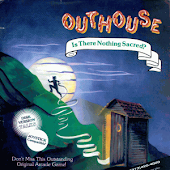 Note: You longtime followers of Retrospace may remember I posted on this topic a while back. I'm not trying to repeat myself, I just felt I didn't do the topic justice. LOve it..."The Case of Gnomeo and Juliet!" She was plastered! I wonder which of these mom would find more disturbing under her son's bed...this or Penthouse? My late brother used to buy a lot of these in the late 70's...some of them had some pretty racy ads in the back pages. 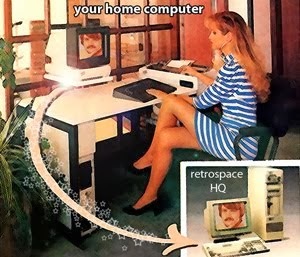 1970's internet so to speak. Martial law, Wisconsin flag.... what? Am I missing something? Geezus! 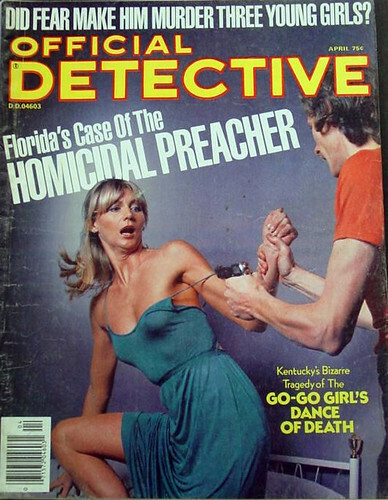 My grandmother always had a big pile of 'True Detective' magazines in a wicker basket by her bed, I was never allowed to look at 'em. 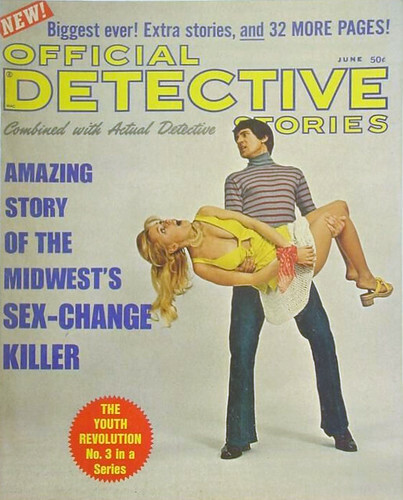 She told me they were crime stories like "Dragnet" and it never made sense to me with those covers but I believed her! 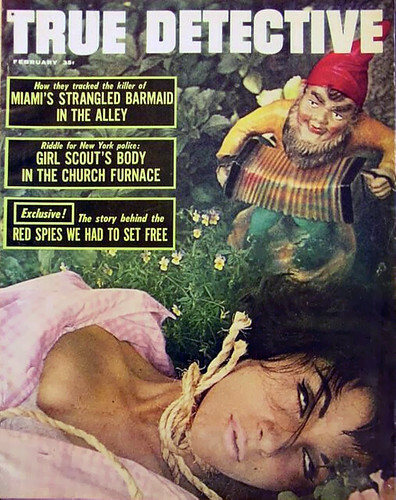 The rope-strangled woman in pink beside the concertina-playing garden dwarf is truly priceless. Ya know, Barney Fife had bound issues of True Blue Detective up in his room. Am I the only one who, after reading the headline, "What Did They Do To the Kidnapped Virgin" reflexively added the phrase, "Ear-lye in the morning"? On my Google Reader feed, at the end of the Retrospace posts, is a Wisconsin Martial Law flag. I have about 40 sites in the Google Reader feed and it only shows up on yours. I thought it was intentional but obviously I am wrong. It's good to see someone open admit enjoying these old mags. I was totally drawn to them when I was a kid, but my mother wouldn't let me get them. Of course I did when I got older and still have a soft spot for them. This was my dad's addiction! He loved these things! I tried to read some once but they ere all the same and all terrible! The only redeeming feature to the teenage boy that I was would be the smutty ads in the back and those were only in the sleazier ones! Brownshirts and martial law??? Is there some hidden aspect to this site I haven't noticed?? #4 down: Tool Time goes horribly wrong! As a child I used to love looking at these in the store because there was plenty of T&A in them and they kept them right along with all the other non-adult magazines! 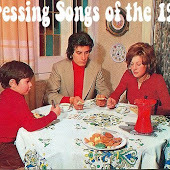 God bless the Seventies and their lack of concern!